I am trying to find my place. I live on this ridiculously huge-small, beautiful-ugly, people-filled planet….and I am just trying to find my place. I don’t want to fit in. To fit in means that I pursue meaningless things for meaningless ends. I want to CARE. I want to care about this planet, about its people, about its land, about its God. Aren’t we all desperately seeking our places here? When we see the condition of the world around us, it seems too impossible to make it better. But what if each of us was able to find a bearable portion of the world’s yuck to carry, and we could actually do something to make a difference? So, based on that boring little journey, you would probably not be surprised by the next part, but I was. My little trip down memory lane did not occur until this weekend, but it would have been trés helpful if it had happened 7 months ago. (Next comes the part of the story that requires a disclaimer. Dear friends who are not Christians, this story will sound nuts to you. Don’t worry, it sounds nuts to me, too. But it happened, and it’s kind of essential to my story, sooo…sorry if I weird you out for a quick second. It’ll pass.) In September, I went for a run one morning before anyone in my house was awake. (Umm..don’t think this is a habit. It probably hasn’t happened since then. Seriously.) So there I was, just running, distracted, minding my business, when suddenly, out of nothing, I heard this: “I want you to live in community with refugees and immigrants.” I stopped running. It was so clear and so weird, that I just stopped in the middle of the sidewalk and stood there. I think I said something like, “What? Where?…WHY? ?” But that was it. Nothing more. I was so unsettled by this bizarre voice which had so rudely interrupted my selfishness that I ran straight home and woke up my poor husband. “I need to talk to you,” I told him nervously. We decided that we needed to be open to anything that looked like an opportunity to walk in that direction, but we carried on for a couple of months..clueless. Little did we know that the house that we would be purchasing on December 1st was right in the middle of the heaviest population of immigrants and refugees in Charlotte. Because God is cool like that. Since 2nd grade, my little heart was being prepared for something. My “thing”. (If you haven’t figured it out, refugees happen to be my thing. And like Switzerland…it is just so random.) I can’t shake it. This “burden” which I felt for this beautiful, lost people group in our country, has now become my passion. God gave me two really great tools for the start of this new journey: (1.) Jen Hatmaker. If you have not read “Interrupted” or “7”, READ THEM. That is all about that. (2.) A friend in the same place as me. During a time when I felt like a martian trying to explain to my friends that God had placed this “thing” on my heart, I received the sweetest voicemail. It was my dear friend, Holly, and she was crying. “Hey Jo, I just need to talk to you because I think you might understand.” I was so scared. I had no idea what she was so upset about, and I was expecting the worst, but instead…my lovely friend could not handle the fact that she could not do more to help the hurting, abused, forgotten kids in her city. I wanted to drive the six hours to Nashville and hug her face off. Her “thing” is giving hope and new life to abused children. Holly is the kind of humble girl who will quietly change her city one person at a time. Even though our passions are not the same, she has been such an encouragement to me. We have a scheduled bi-weekly phone date to try to sort out what to do with these burdens and how to be useful in this world. We just want to find our places. ~Dustin and Shannon: They have spent the last year with foster kids coming in and out of their home, and are now in the first stages of adopting two of their foster children. ~Erika: She has combined her passions for horses and kids and is a ranch manager at Iron Horse Christian Youth Ranch. ~Rob: He is in the works of establishing an amazing organization called the 1M Project which will feed, educate and empower the marginalized. What is YOUR thing?? What gives you life? 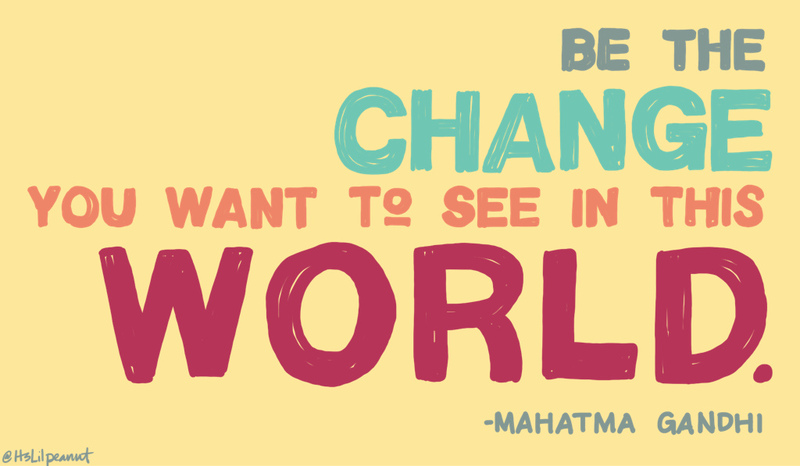 What makes you want to make a difference and find your place? I’m asking because I seriously want to know. Orphans? Recycling? Homelessness? Animals? Slavery? If you are unsure, try taking a wee journey down memory lane to see if there are things that have a common denominator. Let me just say that the difference you make does NOT have to be such a huge thing as the examples I listed above. There is probably a teenager in your city who could really use help with his homework once in a while. Even though it seems like a small thing, you have no idea the difference that could make in his young life. Tonight, Matt and I visited with a man and his wife over supper at a nearby refugee center. You guys. This man was a pastor in his home country of Vietnam, and was imprisoned FOUR times, once with his 4 year old son. What? I cannot even comprehend. He, his wife, and their 7 children now live in Charlotte, where they pastor a Vietnamese church. Matt and I were so humbled and blessed to meet these beautiful people. When we got in the car tonight, I realized that I am finally beginning to find my place. Will you journey with me? I want to know what your thing is. I want to pray for you. I want to walk beside you and make a difference together. Hey Carla!! Thanks for sharing. Love who you are, too! 🙂 Miss you. This is such a great post, Jo! I love the way God has been preparing your heart for this road and placed you exactly where He wants you to walk. And also that you’ve found your THING–I can tell the direction is fueling your passion for the burden the Lord placed on your heart. I would add that I think sometimes there can maybe be “things” for different seasons of life. Maybe the burden will stay the same, but the outreach or service might vary. Thanks, Evelyn! I completely agree. And I LOVE your living small “thing”. It has inspired me to experiment with living small, too. I’m not NEARLY where you are, but I have goals to get closer. 😉 Thanks for being an inspiration! !